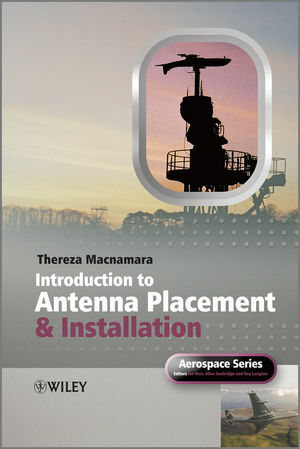 The author addresses the different stages in the process of developing an entire antenna layout, as well as covering individual retrofits on existing platforms. She explains the physics of antenna placement qualitatively, thus obviating the requirement to understand complex mathematical equations. Thereza M. Macnamara attained her first degree in applied physics and her master’s degree in microwaves at London University. After two years of teaching physics up to Advanced level, she worked as a microwave engineer at G&E Bradley. She then worked as a research physicist for Morganite Research and Development before returning to work as a microwave engineer, working on a standard field facility, waveguide components, thermistor detectors, and calibration at Wayne-Kerr Laboratories, Flann Microwave Instruments ad Bradley Electronics. After a short break to have a family, she returned to work as an examiner at the British Patent Office and lecturing in mathematics and physics whilst her children were growing up. She then took up a post as a senior RF engineer at ERA Technology, where she worked on antennas, feed networks and as an EMC engineer, before taking up the post of an electromagnetic specialist at BAE Systems where she worked fro 17 years. Whilst at BAE Systems she worked in the R&D department and on Nimrod, Typhoon, Harrier, Tornado and Jaguar aircraft, and then became the technical coordinator of the EU funded research project IPAS (Installed Performance of Antennas on AeroStructures). Apart from many technical papers, she has also authored a reference book on EMC, entitled “Handbook of Antennas for EMC”. 1 Basic Antenna and Propagation Theory. 1.2 Characteristics of Electromagnetic Waves. 1.3 Interaction between Two Waves. 1.5 Characteristics of an Antenna. 2 Aircraft Systems Using Antennas. 2.2 Frequencies of the Most Common Aircraft Systems. 2.8 Emergency Locator Transmitter/Emergency Position Indicating Radio Beacon. 2.18 Traffic Collision Avoidance System. 3 The Antenna Siting Process. 3.3 Optimum Positions for Blades. 3.5 Certification and Qualification Phase. 4 Frequency and Spatial Coverage Considerations. 4.2 Effect of the Structure on the Spatial Characteristics of the Antenna. 4.3 Combination of Two Waves. 4.4 Measurements on Scaled Test Bodies. 4.5 Effect of Frequency on the Radiation Pattern. 4.6 Effect of Distance from Obstacles. 4.7 Effect of Wings on the Radiation Pattern. 4.8 Effect of the Curved Ground Plane and the Electrical Dimensions of the Fuselage. 4.9 Radiation Patterns on Cylinders in the Absence of Obstacles. 5 Antennas Used on Aircraft. 5.2 Near and Far Fields of an Antenna. 5.14 Model Numbers Used by Different Manufacturers. 6.2 Coupling between Systems on an Aircraft. 6.3 Techniques for Achieving RF Interoperability. 6.5 Coupling due to Radiated Emissions through the Antennas. 6.6 Coupling between Systems with LOS Antennas. 6.7 Coupling between Systems for Antennas on Opposite Surfaces of the Fuselage. 6.8 Existing Formulas Used for Calculating Coupling between Two Antennas on Opposite Surfaces. 6.9 Derivation of an Empirical Formula that Correlates with the Measured Data. 7.2 Overview of Computer Modelling. 7.3 Generic Types of Computer Modelling. 7.5 Finite Difference Time Domain. 7.9 Comparison of Predicted Surface Currents. 7.10 Code-to-code Comparison of Radiation Patterns Predicted on the Simplistic Airframe. 7.11 Relationship between Number of Unknowns and Surface Area. 8.14 In-Flight Measurements for System and Inter-System Testing. 9.1 Centigrade to Fahrenheit Temperature Conversion. 9.2 Conductivity of Common Metals. 9.3 Degrees to Radians and Radians to Degrees. 9.4 Dielectric Constants and Loss Tangents of Common Materials. 9.6 Electromagnetic Spectrum and Frequency Bands for Different Nomenclatures. 9.9 Gain in dB and Gain as a Linear Ratio. 9.11 Imperial to Metric Conversions – Distance, Area, Volume, Speed. 9.14 Power in dBm and Power in Watts. 9.15 Preferred SI Scientific Prefixes. 9.17 VSWR to Return Loss.